Olivier Gamiette designs anything that comes into his head. 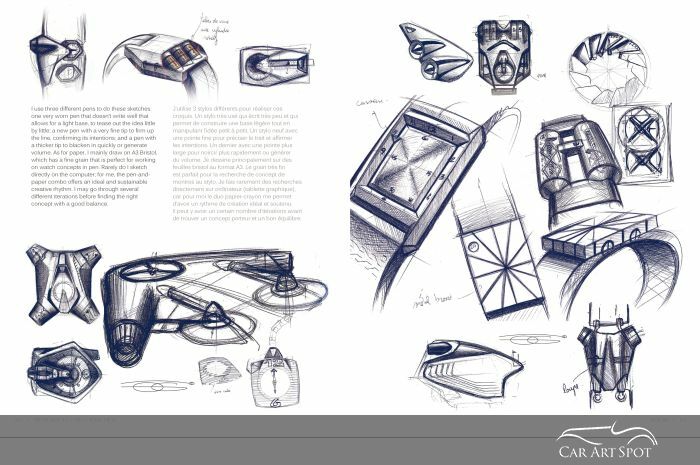 What do cars and watch designs have in common? Unique watches by an automotive designer. 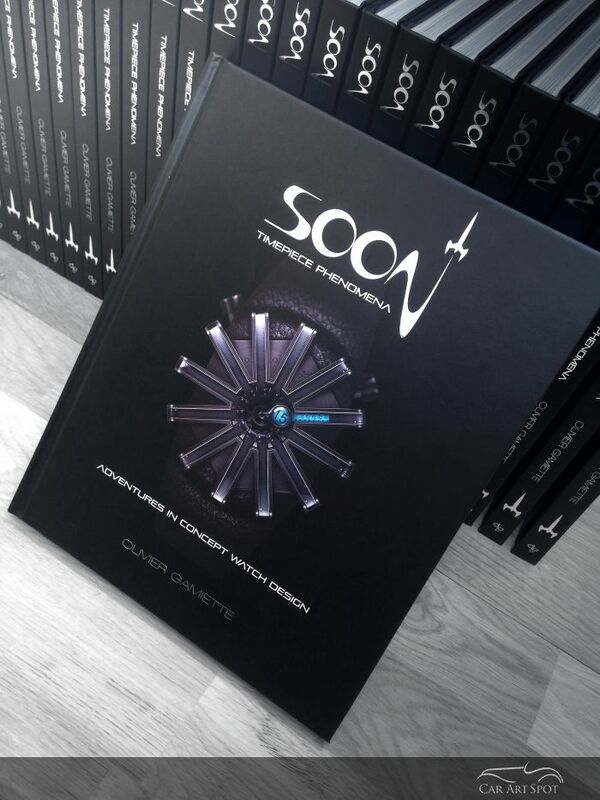 When I noticed that Designstudio press released a book on concept watches made by a car designer, I was intrigued. Cars and watches are worlds apart. The scale and dimensions of the components differ in magnitudes. 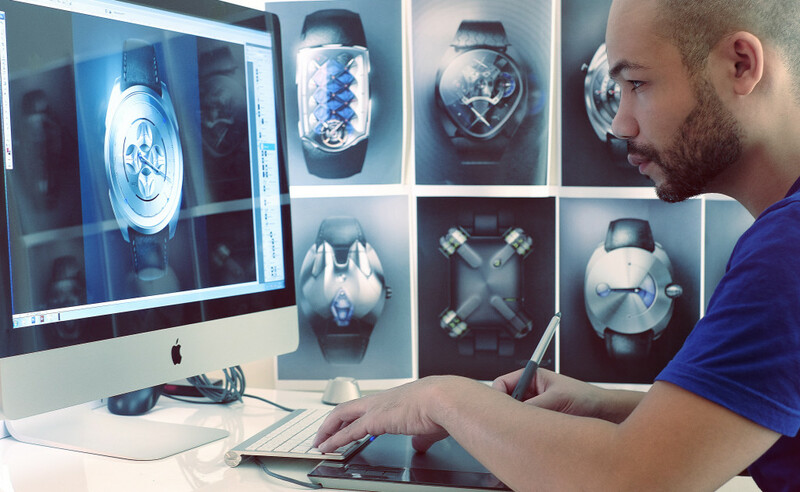 Why would a car designer want to design watches and what is the link? As I started my career as a precision engineer, I have always had an interested in the precision mechanics of timepieces. So when I received the book for a review, my expectations were high. And rightly so, since I spent hours studying Olivier Gamiettes' designs and figuring out how to read the time on some of his designs. I was eager to know more and contacted him for an interview. Here is his story. How did you get into designing and cars Olivier? For some reason I have always been attracted to cars. As a kid, I used to play exclusively with toy cars that I happened to customize myself and I dreamed of one day building my own car. I have also always liked to draw. 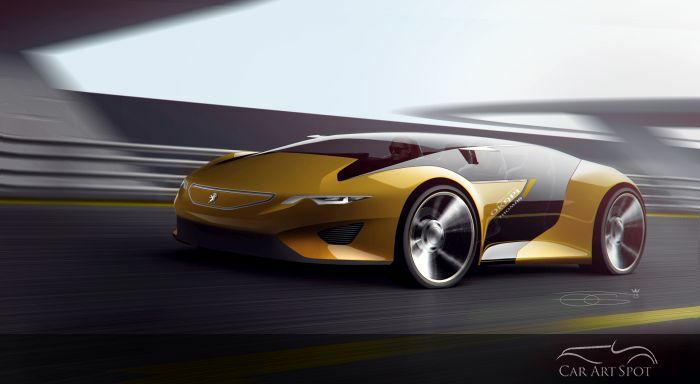 Later I entered the world of professional design as a 3D modeler for the Peugeot brand. I was responsible for converting drawings for designers, the so called « sketches » in 3D surfaces and volumes respecting the technical constraints and mechanical bases of the project. Through the years the creativity spectrum has broadened and today I enjoy designing manifold objects and basically anything that comes into my head. I only considered myself an artist quite recently. Right now, I am into watchmaking. I would say that being an artist AND an engineer has always been a great advantage for me, leading me to imagine credible design solutions, which are original and feasible at the same time. I believe that the work I have done recently, and my concept watches book in particular, have brought together all the pieces of the puzzle of my creative personality. 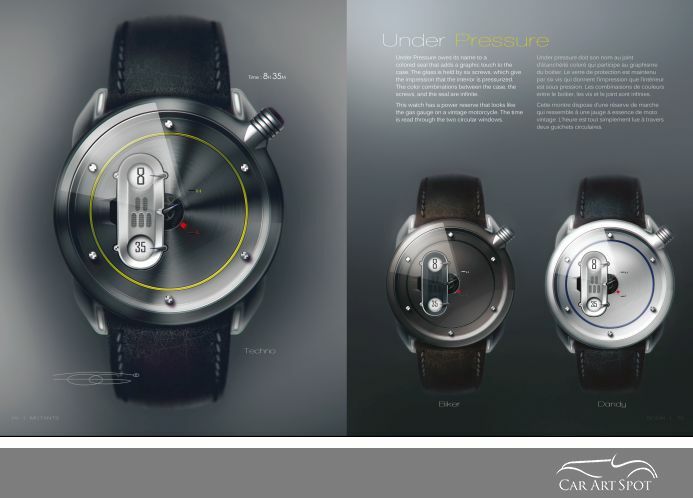 As an automotive designer what did it take to re-calibrate your understanding of dimensions when you started to work on these watch designs? I started from scratch to design these watches, I do not know how it worked, what were the right dimensions, what was the size of the parts. I did drawing after drawing and realized how to articulate this huge puzzle in this small object. I had to dissect a watch to better understand the different plans on which mechanisms lay. I also printed my watches on strips of paper to give me an idea of ​​the size I was manipulating. It also allowed me to understand whether the figures, the details were sufficiently visible and realistic. Everything came gradually. However, I still have a long way to go. Working on a computer screen distorts the perception of the scale for such a small object. Everything is magnified on the screen and it is better to have some real references as a starting point. Several of your designs include car elements. Like the dials on “Copper shield”, “formula 3” and “la Magnifique”. What is your vision on car designs today compared to the past? Which ones inspire you more? Automotive design has probably reached its limits today because the technical and security constraints and regulations as well as the will to make profit naturally, end up in ‘compromise cars’ as a result. This does not mean that we put less effort into making nice cars, it is just more difficult to make an original and strong design. Elitist machines that I cherish the most are becoming as rare as they are not market profitable. On the other hand, with the help of internet, car design trends spread out instantly. Design is too fast and becomes uniform worldwide. Manufacturers share design formulas that seem to appeal to customers and show less enthusiasm to take risks in order to push forward their proper design vision. I think they used to be more insolent in the past, especially in the 70s. It was an age that used to emphasize hard, strict shapes, devoid of gratuitousness. This is a great source of inspiration for my watch designs. Breitling and Bentley are working together and there is a beautiful watch named “La Ferrari”. 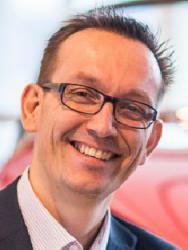 Do you see yourself working together with a specific car brand in the future? 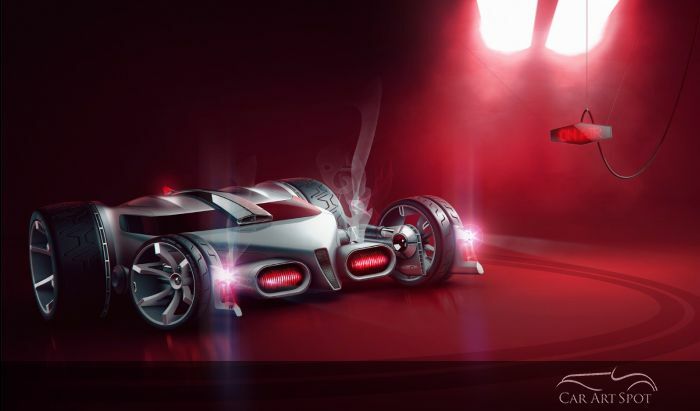 For example, your design “la Magnifique” could be related to Bugatti already. Of course it would be interesting. La Magnifique is only a first draft, we should further develop its own watch philosophy and refine the choice of materials especially if we had to amplify the relationship with this prestigious brand. All car brands are not willing to go as far as Hublot with Ferrari. This is a watch that does not lack audacity even if I would have preferred a smaller size. Other brands may simply want a more wearable, less extravagant watch. Personally, I love strong design watches, that look different from the traditional watch, free from traditional needles to display new kinematics, but I am aware that not everyone feels the same. I would like to work on the sobriety and purity of the dial graphics in the next future. In the 70’s, all Lincoln Continentals came with a Cartier clock. This came to mind when I saw your “Trion”. 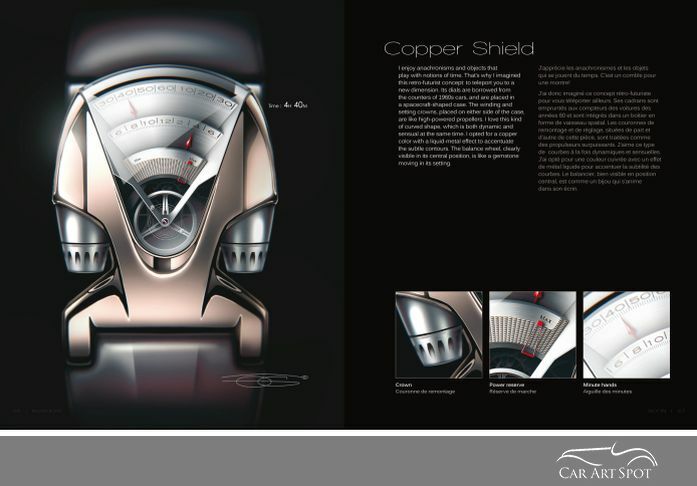 Have your watch designs influenced your automotive designs? I think so, though it is not necessarily conscious. I guess all the ideas in my head talk together. As I said before, there are no borders when I create. There is a bank of shapes in my head that is fed by external images and by my own research which is used for a comprehensive creative process. Your work reminded me of the designs by Daniel Simon. Do you know him? Are there any specific car designers that have influenced you and more specifically, your watch designs. I know the work of Daniel Simon, just like him I like portraying interesting details. His work showed me that one should not be afraid to push boundaries. Beyond its style and its formidable design, it is the coherent universe that he managed to create that inspired me. The notion of creative universe might be hard to understand as it is not palpable nor visible to all. One has the impression of watching fantastic cars and mechanical gear with stunning design but ultimately, it is Daniel Simon’s universe as a whole that stands out. His world lies in our mind and does not stop at the book’s pages. This is what I find the most inspiring. I felt like I wanted to create my own universe around watches. I wanted to imagine a set of objects very different from one other but emanating from one consistent universe, my own creative universe. Do you have a certain theme in your work? As my job is to draw mostly production cars, I escape in my free time by imagining forms which are more free. In my daily work life, there are technical and product specifications and a brand identity to respect, so it is quite complicated to have fun. I like hotrods, custom bikes and very mechanical machines with a metal body. I do a lot of pencil sketches, usually with crayons but also with a ballpoint pen. I inevitably go through this phase because the relationship I have with paper gives me the creative freedom and spontaneity that I have not found with other tools. On paper I can throw down ideas very quickly and instinctively as they arise. I decant sketches for some time before looking at them with a fresher eye later on and select sketches that I will colour with Photoshop. I use Photoshop exclusively for colouring, I never draw with it on the graphic tablet. I believe that the work I have done around the watches is quite unique, as representing such timepieces in a photorealistic way gives them a special identity Actually, watchmaking illustration standard is gouache drawings, digital sketches are hardly ever shown and 3D renderings are too explicit to be done by a machine. Even though I enjoy digital drawings a lot, one day I would like to explore other subjects with more concrete, classical techniques such as oil painting. What inspires you to start a specific artwork? I try to imagine and draw objects that I would like to see in the street. My world is more conceptual than artistically. I'm not just trying to make beautiful illustrations, I am striving to show new and unique ideas, concepts, mechanisms at their best. I do not merely want to draw, I want to create and that is what drives me to draw. Whatever the topic, I always start with a freehand sketch to find new ideas or new shapes. I make many very little drawings on a single sheet of paper. This way, I spend little time doing the design itself, so I can make more spontaneous research without getting tired and wasting my time with a big, detailed drawing. A beautiful design is based on a powerful idea and that can also be expressed in a small sketch. Today’s tools allow to resize the sketch in order to work on the right scale and I like reinterpret my old drawings which I had abandoned. I never throw my drawings away! I usually draw with pencil crayons or a ballpoint pen. In my work I seek principles, ideas that challenge the existing common knowledge. I like to believe that there is another truth than the one we know. 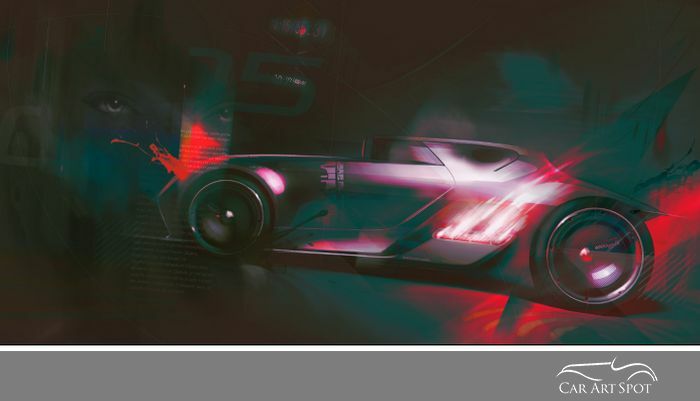 For example, in some car illustrations, I imagine that the scene takes place in a world where light can be solid and therefore transmits efforts. As I have an engineering background, I like to use physical, optical and mechanical phenomena to create new things with style. I have an engineer’s head and an artist's hands. This becomes very clear when I design watches, looking primarily to propose new forms and shapes but also previously unseen kinematics. As many things have already been done before, the challenge is a lot more interesting. Today I am pleased to wear two hats: one as an engineer and the other as an artist. This allows me to be very independent in my creations. As a designer, it is very important for me to create credible, consistent, meaningful and well-drawn objects. I am proud of the infinite potential that this represents. I am also proud to bring this knowledge and convey it to the people through my illustrations. Managing to provide pleasure or emotions by means of a drawing is a great pride and reward for me. I have always liked to see the reflections that become distorted, especially on cars’ metal bodies. I have always wanted to represent this in my drawings. It's a way for me to bring realism to the object in the drawing because this will psychologically melt in its’ environment. The brain interprets the reflections and understands that the object is integrated in the scene. My math’s curriculum led me to understand the tricks of such deformations. And it is trying to imitate reality that I have found the effects and functions to translate it on Photoshop over time. Today my designs borrow certain physical phenomena from reality, but they remain mere illustrations of reality. Do you prefer any specific materials or tools? As a designer, my favourite tool is the black pencil which I use on Bristol paper which ages better in time. I am not looking to make beautiful designs in this phase but try to grasp the idea that lurks in my head and pencil crayons or ballpoint pen allow me to capture it very quickly with little loss. That's why I do not do my research on the graphic tablet; it disturbs my creative rhythm. Moreover, coloured pencils allow you to shade the drawing, creating the illusion of volume which is the best! It is more difficult with a ballpoint pen to draw the volume’s shadows. After defining the linework to create the shape, I quickly shade the drawing to mark down the volumes in order to keep the idea for the second phase. The second phase, in fact, hinges on the Photoshop tool. There are other digital tools to colour drawings on the computer but I have known this program for a long time. This phase is very technical because it consists in creating volumes with light and shadow and also to generate perceived material finish that is not borrowed from any picture. For example, for many of my watches I use a brushed copper finish which I draw exclusively with Photoshop. I like layer management a lot because the possibilities are endless. Yes, but I like to expose the topics that I want to develop to my creative partners (Nicolas Depierre and Alexandre Meyer). They are my favourite guinea pigs! They share my vision of design and their reactions tell me about the relevance of my concepts and intentions. Before moving to the colour phase which can take a long time, it is valuable for me to have some intermediate feedback. Do you work in silence or with music? What type of music? I find this question particularly interesting because artists’ work is usually shown without specifying the context in which such artists operate or the atmosphere in which they create. It is important for me to work with music, it is like taking a warm bath. I feel immersed in my world of vibrations, of feelings and inner exchanges enhancing the desire to create. Do you have a favourite car design? For me car design is a huge puzzle. That said I do not like a particular brand above others, but I like the stance of some manufacturers, I like cars that have a well defined character and a clear formal language. Finally, if there was only one car to remember, I would say that for me Bertone Stratos Zero is the most fantastic car ever imagined. The line is simply amazing and timeless. I own a Plymouth Prowler 1999 that I bought in the US back in 2003. It is a very original car which does not go unnoticed here in Paris. However, I bought it for its line and proportions that are very close to a designer’s fantasies. It is an uncompromising car; that is what I like. 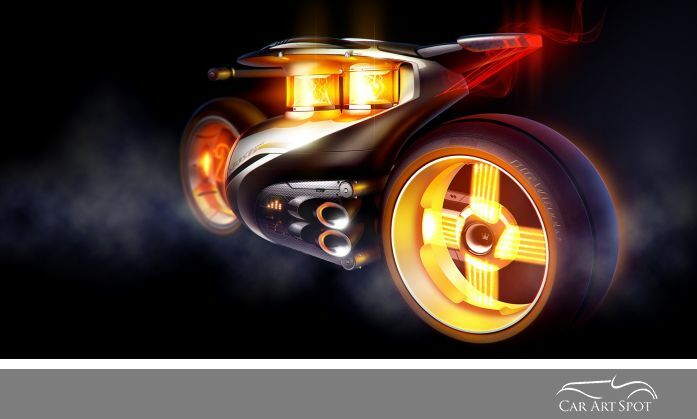 What is your advice for people who want to become an Automotive Artist? Be patient, because nothing happens overnight. It takes time to practice and find an artistic identity which is natural and consistent with your own self. One must get inspiration from other artists but it has its’ limits. You have to tell your own story and claim your uniqueness. Do not be afraid to be different or to see things differently, it is a chance to have this vision instead. You must practice regularly and learn to listen to others’ feedback because the purpose of your work is to be seen and appreciated by the public. It is that people see from the outside what we express from the inside as artists. 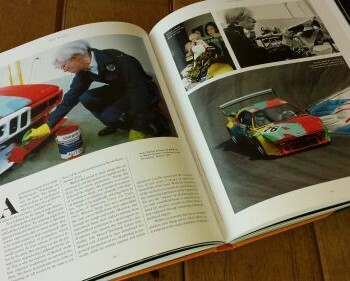 Is this a book for car fans? No, it's not. There are no cars in this book. But is it a book for anyone interested in car design? Then the answer is definitely yes. It will give you a deeper appreciation of what it takes to design devices and objects. How to bridge technical challenges and how to be innovative and break traditional boundaries. 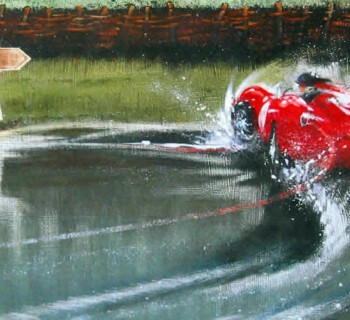 To see more of Olivier Gamiettes work, please visit his website. Book is published by Designstudio press. and available here.